Using various Carter fuel pump catalogs, I have researched the Carter numbers and have provided a chart of those numbers for help in determining the correct original part number for your 55- 65 300. * In 1962 some cars were produced with a 426 engine. Those engines used fuel pump M3446. ** Due to production redundancy, the 58 fuel pump was superceded with the 57 number M2610S pump. 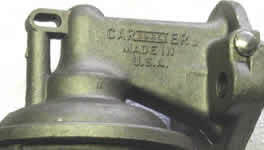 The 59 and 60 pumps were later superceded with the M2371 pump. That makes locating those original pump numbers more difficult as they were made for a shorter period of time. *** The 1965 fuel pump book seems to indicate that the M3672 pump for 1965 was not the OE pump. Did Chrysler buy their OE pumps from another supplier in 1965? Listed Below are Carter numbers for the original fuel pump as shown in the Carter Catalogs. The photos above show the difference between an early and late fuel pumps in 1957. 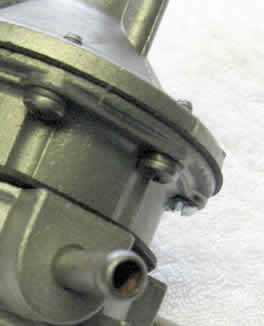 The early pump has the threaded attachment at the inlet. The late 57 pump had the inlet tube fixed to the pump. Carter number is stamped on mounting flange edge. Fuel pump body in the 50s with Carter lettering. Also note loop at top left in casting and open space to the right of tube. Later, the open space would be filled in by casting materials and in the 60s the lettering was dropped. Some years there were changes during the year with an early and late pump using different numbers. 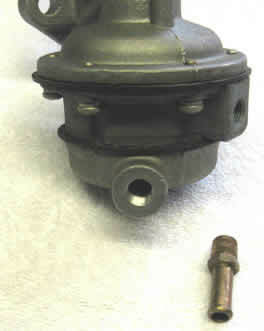 Chrysler used Carter fuel pumps as original equipment during the 50s and 60s. These pumps evolved over time so that their external appearance changed slightly. There are other details that changed also.